Rabbi Shafran has a good point. The crux of the matter, indeed, is that the two of us, friendship aside, employ very different definitions of anti-Semitism. Rabbi Shafran prefers his definition, he tells us, because the broader one (and I will remind our readers that it is one that was accepted by many, including the US State Dept. for many years) would put too many people on the same spectrum. He asks whether I am comfortable putting Farrakhan and Airbnb on the same spectrum. Well, yes. I would. They don’t occupy the same position on that spectrum, but it is the very same spectrum. It is a spectrum so roomy that no one on it needs to fear getting crowded for space. Let me explain the reason for my preference. Both Rabbi Shafran and I hold day jobs for organizations that do Jewish advocacy – he for Agudah, myself for the Simon Wiesenthal Center. The two are very different, which means that the two of us get to meet and converse with different people. I have met plenty of philo-Semites, BH. I’ve encountered as well many anti-Semites. A large number of the latter are people I would call unconscious anti-Semites. I believe that they are the largest sub-group within this population. They usually fail to realize that their positions and arguments are based on animus towards Jews until someone makes them consider the basis of their positions. Why are they employing a double standard? Why are they critical of Jews or of Israel when they are not of comparable faults in others? After some reflection, they realize that they grew up with a low-grade hostility to Jews that was in the family as far back as anyone could tell. I’ve met people who were so taken aback by this self-discovery, that they became fierce advocates for Jews and Israel as a way of extirpating the anti-Semitism within them. The vast majority, of course, never encounter the questions, and never come to the realization that they are keeping alive a hostility to Jews that was the rule, rather than the exception, for the last two millennia. I believe that we have more to fear from the unconscious, low-grade hostility than from the mad-dog extremists. The latter will be few in number, and can (possibly) be contained by countermeasures and increased security. The former will be the reason why Jewish students on campus are seeing their safety and security undermined, with administrations unwilling to do for them what they routinely do for minorities whose causes are more PC. The former will join the boycotts of Israel still to come; they will fail to call out the politicians who cozy up to Farrakhan; they will look the other way as more virulent strains of anti-Semitism percolate around them and fail to stop them before it is too late. The anti-Semites that Rabbi Shafran worries about cannot succeed unless the ones that concern me yield ground to them. Rabbi Shafran says that he will continue to fight discrimination, even when it is not motivated by anti-Jewish animus. Great. We need that. Meanwhile, I will go on fighting anti-Jewish animus, even when it is not attached to immediate discrimination. There is plenty of work for both of us. I must add that we seem to disagree about one other idea. Rabbi Shafran works for Agudah, whose careful and considered use of language in its public pronouncement can teach all of us a thing or two. (I write this quite seriously, not facetiously.) Agudah understands the power of words and their consequences. I am therefore disappointed in the Hamodia article, even if I would agree with its premise – which I don’t. The argument set forth in that article has the unintended consequence of providing cover for our enemies in the BDS movement. It can be cited by the proponents of the next generation of boycotts to demonstrate that even the Jews admit that one can point to the occupation as the root of all ME evil without any taint of anti-Semitism. We should not be offering succor to our enemies. Rabbi Shafran is usually far better than me in anticipating the unintended consequences of a statement or action. I am puzzled as to why this did not happen in regard to Airbnb. Rabbi Shafran DID anticipate the unintended consequences of a statement. And with his keen anticipation he determined his Hamodia article would NOT have the unintended consequences that R. Adlerstein mistakenly attributes to it. Collectively, with HaShem’s help, we have enough time in our days to address all antisemitic threats appropriately, regardless of their immediacy, severity and motivation. It’s OK to deal with one’s own concerns or fears, recognizing that other people need to address other concerns and fears. The overall situation is both ominous and fluid. Also note that any erosion of constitutional government and the rule of law hurts Jews disproportionately. How do we defend our right to live and impart Torah values freely under arbitrary rule, even when that is not expressly antisemitic? Both the Constitution and law in general are under concerted attack, and close to half of all Americans seem OK with that or oblivious. Am I missing something here? Am I not really understanding what this conversation is all about? Because at least according to my understanding, what seems to be under discussion is whether or not one can be anti-Israel without being antisemitic. If that is indeed the issue at hand, I for the life of me just do not understand how this issue can even be an issue at all. Is it not clear that if a given person wishes to destroy my home, even claiming that I do not have the right to my own home, is probably a really good indication that the person does not like me very much? And in this case, this is not just any old home. We are talking here about Israel, the land promised to us by G-d so many thousands of years ago (it even says so in the most influential book of all time, namely the Torah), the land we Jews have been praying for thousands of years to return to, the land that righteous gentile Arthur Balfour realized belongs to us, the land we purchased from the Arabs even though we were not even required to do so since the land is really ours anyway, and the land that we earned in any case due to the defensive wars our people fought against our sworn islamoNazi enemies. Honestly, I don’t really believe that anybody truly believes that Israel does not belong to us Jews. Those who claim that it doesn’t, are just playing sadistic games with us. They enjoy torturing us because hey, if the nazis made gassing our people to death unfashionable, than the least they can do for their own pleasure is to use verbal mumbo jumbo in their attempts to take our precious little Jewish land away from us. In any case, I am really tired of us Jews always cutting slack for our enemies, whether that means handing over precious pieces of our Jewish land to our enemies, or pulling back from military victory just when we have them on the run, or otherwise finding ways to give them the benefit of the doubt when they clearly do not deserve it. Let’s just call a spade a spade, and an antisemite an antisemite, and if they call us names in response, well, that should be their problem, not ours. Rabbi Shafran should be lauded for not being afraid to present positions that are contrary to main stream thinking in a coherent and articulate way. All too often the voices of shrillness that yell anti-semitism at every perceived infraction of bias against Israel dominate the pages of frum media. Hyperbole and sensationalism are the norm of the day. 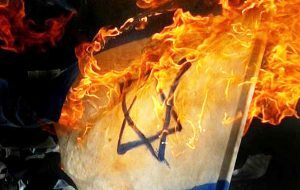 The term anti-Semite is cheapened because it so easily thrown around at those that have different political views than those of right wing Israelis and American Jews. Rabbi Shafran causes people to stop and think instead of merely playing to the echo chamber and stiring the cauldron of hate and anger.